The 3rd Glass Bulletin Awards (GBA) 2018, GB’s novel initiative to present to the industry a platform that appreciates talent and encourages discourse, was held with much fanfare in Mumbai on September 7. National – Fuso Glass India Pvt. Ltd.
East Zone – Britannia Glass Co.
North Zone – Design-N-Glass Inc.
National Zone – Glasstech Industries India Pvt. Ltd.
West Zone – RCMPA Polishing Technologies Pvt. Ltd.
All sponsors of the event were felicitated on stage. These included Diamond Sponsor Messe Dusseldorf India Pvt Ltd and co-sponsors Techno Trade Links / Sanay Glass Engineers, Aardwolf Material Handling Solutions, Shanghai Northglass Technology Industrial Co., Ltd, Masss Glass India Pvt Ltd, KK Glass, EssPee Glass Studio Pvt. Ltd., Bhandari Glass and JinGlass. 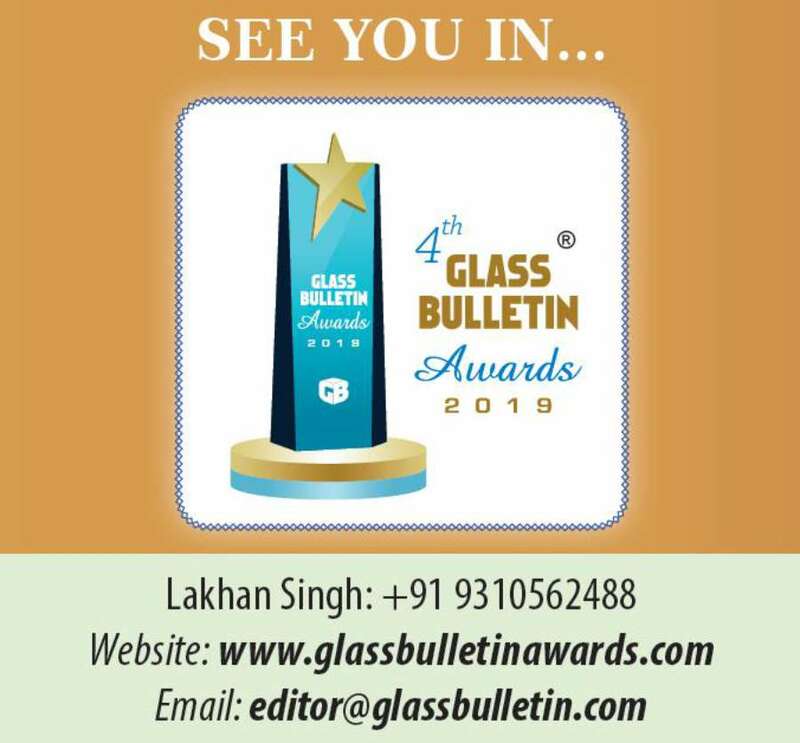 The Glass Bulletin Team that had worked tirelessly for the event were introduced to the audience, following which Glass Bulletin Editor Mr. Lakhan Singh took the stage to give the “vote of thanks”. Mr Singh took the opportunity to give the audience a glimpse of next year’s Glass Bulletin Awards and glasspro exhibition. Mr Singh thanked the VVIP dignitaries and guests, sponsors, participants and award winners, team Grey (event partner), associations working for the industry and invited everybody to Glass Bulletin Awards 2019 and glasspro INDIA 2019. With this, as the event wrapped up, the guests headed for dinner and signed the day off on a high note.